MXL puts out a decent microphone for a excellent price. The MXL 990 has many uses. It is great for vocals, guitar, strings, horns, and more. It has a very sleek and vintage look to it. It comes with a shock-mount and a case. 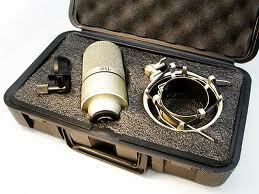 When I first brought this mic home, I tried it on vocals. It really brings out high end wonderfully, and low end is tight. We also tried it out on bass guitar. It held it's own and made a great sounding recording. You will not be disappointed. A really affordable microphone. It sells at Guitar Center for around $80. Click the link below for exclusive deals.